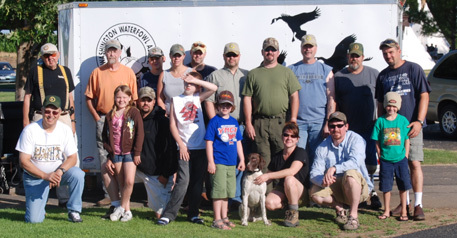 With nearly 70 years of volunteerism to its credit, Washington Waterfowl Association, (WWA) is a 501(c)(3) tax exempt, non-profit corporation dedicated to waterfowl conservation, habitat improvement, and hunting within the State of Washington. With chapters across the state, we focus on putting your ideas and your donations into action, in your area. Our projects include nest box construction, litter pickup projects, nest counts, Eagle Scout and other youth group programs, monthly chapter meetings, working at federal refuges and state wildlife areas, participation in sportsman's shows, youth gun safety and hunter education classes, hosting shooting events, building blinds (including access for disable persons), working with local Tribes, and planting of food plots for waterfowl, to name a few! And when our hunting heritage is threatened, WWA has stepped to the plate with strong political action, in addition to tailoring legislation and game laws for the benefit of waterfowl and waterfowl hunters. We don't "contract out" our efforts, our members and their families roll up their sleeves and work together as a team to complete our projects. We have a real sense of community and fellowship as we donate our time to enhance habitat and promote our favorite pastime, waterfowling!